Visual artist and educator Kristen Cliffel brings her extensive arts experience and joy of teaching to help students create a visually stunning mural or work of public art. 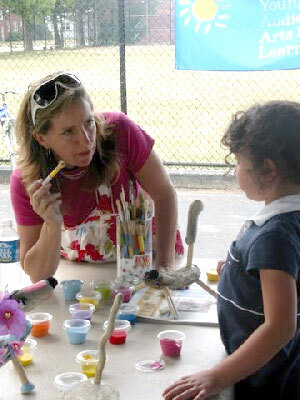 Using different techniques and materials, students of all ages work with Kristen to design a mural that could frame a doorway, embellish a bench or beautify any space. The mural could be created from ceramics or found and recycled objects from the neighborhood. The design and images for the mural may be based on poetry and writing or a theme devised by the students. With Kristen’s expertise, students, teachers and even parents collaborate to create a work of art that reflects their own ideas and is meaningful for themselves and their community. The amount of time needed depends upon the scope of the project. All projects are hands-on and fun! Create Murals can be a fabulous out of school time program, too.